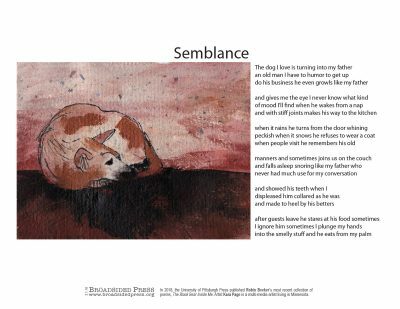 Collaborators’ Q&A: Artist Kara Page: I wanted to use warm colors when I read this poem. I think of warm colors as welcoming, but there is another side to them that reflects more intense emotion, like anger or passion. 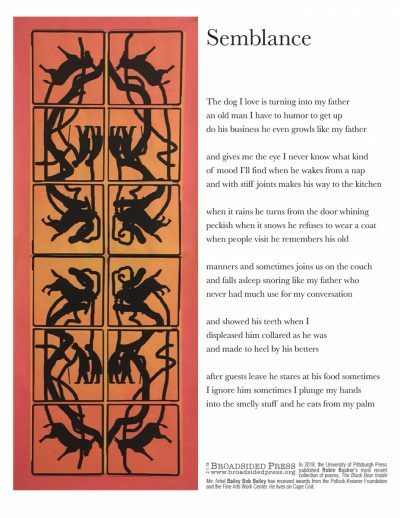 Poet Robin Becker: By choosing red as the dominant color, Page emphasized the “blood” connection between dogs and people. Artist Kara Page is a multi-media artist living in Minnesota. Poet Robin Becker‘s newest collection of poems is The Black Bear Inside Me, forthcoming in March, 2018. It includes this poem.